I just added this postcard to my collection. I have over 500 postcards from my hometown, Waterbury, but I have not added anything new in a long time because I already owned just about everything for sale that was reasonably priced. Suddenly, last week, this previously unknown (by me) Waterbury postcard showed up on eBay twice, being auctioned off by two different sellers --- go figure. 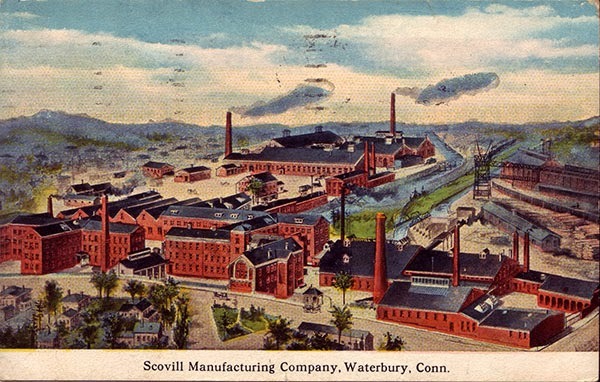 The postcard depicts the East End factory complex of one of the largest employers in Waterbury during the 20th Century. Postmarked 1919, the scene looks very different today. The left side of this scene is now the site of a shopping mall; interstate highway I-84 occupies the right side. The only parts of the complex that remain today are the smokestack front left and the building front center, which now serves as the Timexpo Timex Museum.